A Brentwood community is being victimized by what they believe is a group of juveniles egging their homes. Cheryl Hurd reports. A Brentwood community is being victimized by what they believe is a group of juveniles egging their homes. In one case the vandals threw illegal fireworks at a front door. The incidents have left residents angry and in some cases frightened. 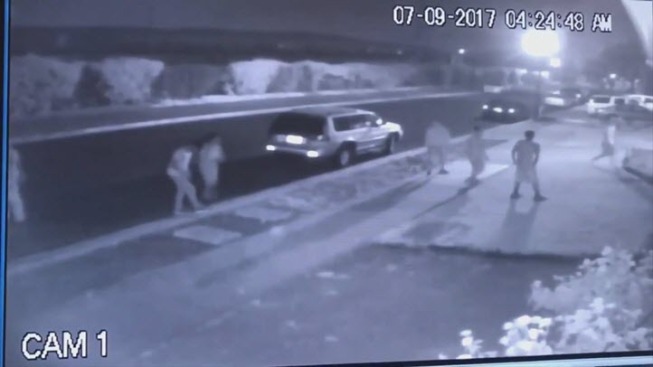 Surveillance video taken from one victim's home shows what appears to be a large group of teenagers throwing raw eggs at a Brentwood house. Another video taken July 3 shows someone tossing what appears to be an M80 illegal firework toward a home. One homeowner is feeling harassed with his home targeted three times this month. In those incidents eggs where thrown on resident's home and cars. Police report about 16 incidents of vandalism over the past three weeks. An investigator is looking into all of the incidents to see if they are all related, police said. One homeowner concerned about the safety of his children is fed up and cannot wait for the vandals to get caught. Meanwhile, surveillance video taken from several different sources is giving police some valuable leads. Police said if they catch the suspects and they turn out to be juveniles, their parents could be held liable.